Toby and Maiko's home seems to be as much about community building as about home building. The day we spent working on the house a good feeling of learning and cooperation pervaded the site, and after reading their blog it clearly infuses every beam and bale. From the house blessing ceremony to working on the logs side by side with their team of experts, Square One is now an integral part of an ever-expanding web of people. The Weymiller's home has also been a long time in the making. Trying to live their ideas as much as possible, Square One is an example of how living a sustainable, eco-friendly lifestyle does not mean deprivation. It beautifully illustrates the viability of alternative building materials and the real potential they hold for our future. In this last part of our interview, Toby reflects on the project, the process, and what it means to live sustainably. PH: One thing that really struck me while reading your blog is the amount of community involvement that occurred, and the community connections constantly that were made. Did you expect or even suspect how much it would come to be about community? What do you think makes a project like this attractive to people and draws them together? TW: Was I surprised? Not really. Why? Because we had participated in workshops in North America and found similar responses. People are attracted to projects like this for many reasons, but the majority come because they are interested in the concept. What is the concept? For some, it's straw bale itself. Others are interested in the eco-friendly aspect of the work, while some are drawn to the hands-on, do-it-yourself aspect of this kind of work. To keep them all coming back, we tried to make sure everyone was getting what they expected. For most participants, that was an education. Others came because they are friends or family and wanted to help. A few people were neighbors that, I believe, wanted to get our new relationship off to a nice start. We really needed to get our house built in small windows of nice weather, but we also tried our best to make the workshops as enjoyable and educational as possible. The potlucks were great for this as were a few other after-workshop events. PH: How would you describe the community reaction to the house? TW: The reaction has been very positive. We haven't had an offical house warming yet, so all the uwasa (rumors) we hear are just about what the house looks like from the outside. So far, it's all been positive about how beautiful it is. Aesthetics were very important to us, but not the most important thing; however, having it turn out so beautiful was a big, big plus for us!! 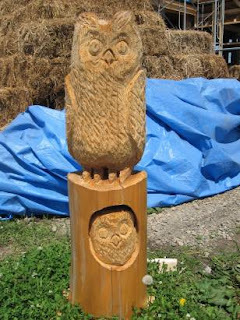 *Toby and Maiko's builders carved three owls for Square One. One sits in the eaves above their deck, and the other two are on the front corners of their property greeting guests and passersby. The word fuko in Japanese means happiness, and so the owl, fukuoru is a cultural symbol of happiness and family. Known also as kotan koro kamui or village guardian by the Ainu, the native people of Hokkaido, they also offer a sense of protection and safety. PH: Looking back, what is an unexpected benefit of the project? TW: I think the most unexpected benefits will roll in as we get more settled. Off the top of my head, I can't think of any unexpected benefits except for the reaction and traffic from the blog. I am always impressed with the power of the internet, but wasn't personnally touched by it until now. Some of the workshop participants found out about us from the blog. One even came from as far away as Osaka. We've also received interest - blog followers and fans - from far away places. Frederica from Italy even did a college project on our house. PH: I have to say that one of the things I found inspiring is how upbeat you both always sounded even when hinting at tension and stress. How did you do that? Was it really important to the two of you to always keep a positive outlook? TW: Yes, there were some really stressful times and Square One was not built without tears...mostly mine. Because of the traffic on the blog and my desire to keep my family in the loop as much as possible, I really focused on getting a post out every day no matter what my state of mind was. Putting words down helped keep me positive as there were some seriously difficult times during the build. Instead of writing about the negative stuff, I chose to keep it positive and get the house built with as little stress and tension as possible. Thinking about your question, remembering those stressful moments and seeing the name of our house again, I want to add something else. I think this philosophy - focusing on the positive and moving forward - can be used in life, too. There are always going to be bumps in the road, and you can either address them, let them stop you in your tracks, or totally ignore them and try to act like they aren't happening. By acknowledging them in a positive manner, you can have a much smoother drive down the road. PH: What made your project different than other more conventional house-building projects? TW: It was very hands-on by us, the owners, and other normal folks. It has more of a personal touch than any conventional house. When we walk around our house, I usually have a story for everything someone points out. I don't think anyone has that personal of a touch with conventional building. PH: It struck me as well that those working for you were also working with you. How would you characterize your relationship with these folks? How do you think that impacts the project and the process? TW: It makes the project more personal, and it probably makes those people feel a little more responsible for the end result. I would consider everyone who worked on the project and helped us build this amazing house of straw and mud our friends! PH: If you had it to do again, would you do anything differently? TW: Yes, and I think anyone who honestly answers this question would say the same. I believe every project like this is going to have its challenges and ours was no different. However, I also believe the challenges were a necessary yin to go with the yang. PH: What advice would you give to someone embarking on a similar project? TW: I'd say two main things. One, do not let the nay-sayers get you down. Stay focused, stick to the facts, and don't let anyone rain on your parade. Two, I would highly recommend connecting to a network of professionals to get their advice on things during the designing and planning stage as well as during the build. If you are limited to one or two people, you might not be getting the full array of options. For example, we were introduced to a Yahoo! 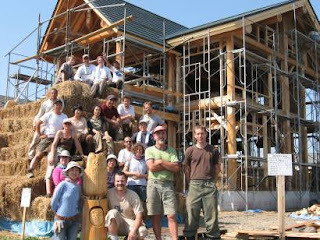 group on straw bale construction. Through them I've received some amazing feedback on what to do for the final coat on the house. Many recommended what we are doing, and that gave us great peace of mind. Tomorrow I'll share Toby's list of favorite resources that guided he and Maiko through the project. For up to the moment information on Square One, check out their blog, and read the first and second installments of my interview with Toby to get the perspective of one straw bale build in Japan. What a great interview!! Thanks for making this available. It was great to see how building the house helped to build a community. I liked how the owls are bringing children around- what a nice touch. Great post!! Really enjoyed this series. I'm glad you enjoyed them! I had a great time talking with Toby and Maiko about this, and I'm hoping to head back up this summer to see the finished product for myself. The final coat of plaster is underway at this very moment, so we've all got our fingers crossed. Some really amazing community building is happening there, which is also very important to Toby and Maiko. It's exciting stuff!